This page is a work in progress – it’ll be updated as needed or suggested. What’s up with the bulldogs? As a (mostly) one-man operation, primarily working in the early mornings before I head off to work, I often have little-to-no time for QA. Mistakes happen. 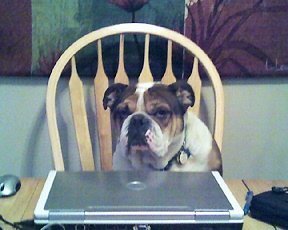 As a joke, I blamed a typo on my bulldog Spike, saying he was the best copyeditor I could afford. People loved it and so I’ve been using bulldog-related pics as a meme ever since. Spike passed away in June 2012 and was replaced by Louisville (pictured, right) in August 2012. 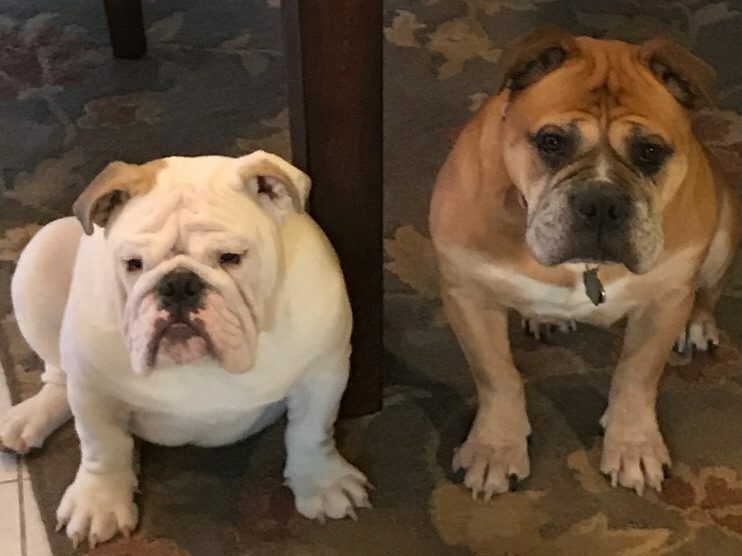 Boomer (pictured, left) joined the editorial staff in June 2017. No, it’s not short for Original Gangster, but Organizational Guy. One of the hardest truths about following minor-league baseball is the realization that the overwhelming majority of these guys aren’t going to make it to The Show. An OG is a player that fits that description but has a further layer of distinction in that he is a homegrown player who has been willing to bounce around levels, positions, and usage (starting, relieving, coming off the bench, etc.) or simply has been with the organization for a long time. Beat writers will often write their stories as the game is happening in order to hit deadlines. If you think it’s agony as a fan when the bullpen blows it in the 9th, it’s even worse for the sportswriters who may have everything they just wrote go up in smoke. A sportswriter’s win is when a team takes a commanding lead by scoring a bunch of runs in the bottom of 8th (or top of the 9th) such that what they’ve written (or what they can now write) is safe. That’s a 0-0 ballgame—there’s no such thing as a scoreless game; it starts at 0-0, not null-null—that’s gone past the 4th or 5th inning. Thus, there are a lot of zeroes on the scoreboard. Yours truly is a New England native – get over it, the DMV is filled with transplants – and this a reference to how the Boston Celtics, who used to practice at Hellenic College, would conjure up fake injuries to sideline an underperforming player. The same thing happens in the minors, so if you believe that everyone on the DL is actually hurt… have I got some real estate in Florida for you! It’s been scaled back from a weekly feature to semi-weekly to a monthly feature, but it’s fun exercise where I point out who’s doing really well (“Good”), who’s doing really poorly (“Bad”) and who’s surprising (“Interesting”). It’s based off a skit that comedian Demetri Martin used to do. As you might expect, if you understand baseball, hot streaks can often be followed by cold streaks. When the latter happens, and the player has been hailed as a “Good,” it’s blamed on the “Curse of the GBI” instead of the much more boring (but more accurate) reversion to the mean. For what it’s worth, it happens both ways, but people tend to notice the good player going bad more often than vice-versa. What’s the difference between promoted, transferred, and reassigned? These are all terms used when a player is moved from one team or roster to another. Some affiliates like to use the word “promoted” for any upward movement and “transferred” for anything negative. Injuries cloud this situation constantly and tremendously – Player X goes on the DL, Player Y is called up to take Player X’s spot, Player Z is called up to replace Player Y; it’s specious to say that Player Z was promoted. Thus, the word “reassigned” has become the preferred word for transactions, especially for any that appear to be related to an injury. True promotions are much less common than fans realize (or want). Confession: I’ll admit to using “reassigned” instead of “demoted” to spare feelings. During the dark times (roughly 2007-2011), there was a small-but-vocal coterie of “fans” who would wail anywhere and everywhere online that “The Lerners Are CHEEP” and complain about the lack of spending. They would come to this site and Nationals Farm Authority, not out of interest in the minor-league players but out of distaste for the major-league players, and complain about the kids not being promoted fast enough. Obviously, since the signing of Jayson Werth, and beginning with Yunesky Maya, sizable payouts to IFAs, that interpretation just simply isn’t true. Thus, like Lt. Dan from “Forrest Gump,” they have no legs to stand on. In 2008, the Nats had a 23-y.o. tearing up Low-A named Bill Rhinehart. He was moved from Hagerstown to Harrisburg in the space of two weeks, in what felt like then-GM Jim Bowden bowing to pressure from the Lt. Dans because the big club was doing miserably. While he did very well in the AFL that fall, Rhinehart’s development was stunted and he was even dropped back down from AA to High-A in 2010. He played just one full season at AAA and retired at 27. The term is still used when a player is promoted too fast or a fear that he is being rushed. It’s an in-season excused absence for things like paternity leave, bereavement leave, or any other personal leave or situation (e.g. incarceration). It’s unique to the minors. The Nationals seem to also use it to juggle pitchers, since starting pitchers go at least 4-5 days between starts. Generally speaking, it’s players who have retired but the organization wishes to hold on to their rights so that they can’t play elsewhere. It is pretty arbitrary to say the least, but that’s par for the course in the minors. Designated for Assignment. This is a maneuver that the big club will do with a guy to remove him from the 40-man roster, usually (but not necessarily) if he is out of options. Once a player is “DFA’d” he’s in limbo for a few days during which another major league club can claim him and work out a trade (and put him on its 40-man roster). After that, he is outrighted to the minors if (A) he has never been outrighted before (B) he has less than less than three years MLB service time. What’s the deal with options? This was a bigger issue when the Nationals were terrible and there were constant calls from the Lt. Dans to “play the kids” (e.g. Justin Maxwell). Basically, once a player is added to the 40-man roster during the 25-man period (a.k.a. Opening Day to August 31), he can be sent up and back to the minors for three seasons (and sometimes four) until the player accrues five years of major-league service, at which point the player can refuse (and become a free agent). Naturally, there are exceptions… a player can be sent down for up to 20 consecutive days without an option being “burned” and rehab assignments are excluded. This is why you’ll see some players get sent up or down in early April or late August – the front office is gaming the “20-day” exception. What’s a six-year free agent? This is also known as a minor-league free agent or MLFA for short. It’s a bit of a misnomer, because it really means seven seasons. Once a player is drafted, he is bound to the organization for six years. If he’s not signed to an MLB contract by then (and/or is not released or placed on a restricted list), he becomes a free agent and can sign with another organization. For example, players drafted in June 2012 will become free agents after this season, but they will (or could) have played seven seasons, even if the first one was short. In between, there is one “escape option,” known as the Rule 5 draft in which players become eligible to be selected based on their age and experience. What’s the Rule 5 Draft? Before the amateur draft, now known as the First-Year Player Draft and takes place in June, this was the only way a player could move from one organization to another without being released or traded. It’s a bit of a relic, but because of its timing–the last day of the Winter Meetings in December–it’s unlikely to go away because it generates publicity. Simplified, if a player is 18 or younger when he is drafted or signed, the team doesn’t have to protect him for five seasons; if 19 or older, it’s four seasons. This is why you will sometimes see a young player (typically an IFA) who hasn’t even reached AA added to the 40-man roster in November, which exempts them from the Rule 5 Draft. The Draft has three phases: MLB, AAA, and AA. Players taken in the MLB phase must be added to the drafting team’s 40-man roster, while the players taken in the AAA and AA phases must be added to the reserve list one classification above the reserve list that they player was previously on. The reserve lists for the minor-league phases are not made public, thus there’s very little speculation or interest, and few players are drafted in the minor-league phase anyway. It’s an International Free Agent, i.e. someone who is not a resident of Canada, the United States or its Commonwealths (e.g. Puerto Rico, the District of Columbia), Possessions, or Territories. I’ve italicized resident because sometimes a talented Dominican player born in the U.S. will move to the Dominican Republic (D.R.) in order to avoid the draft, sign at an earlier age, and/or get a larger bonus. Generally speaking, an IFA refers to a player from the D.R. or Venezuela, though more and more players are coming from countries such as Cuba and Japan.